Assembly of this high chair was a breeze. I used to order them assembled, but I thought I would give assembling myself a try to save some money. I will always get them this way now. It went together great and is clearly sturdy. The high chairs were sturdy and easy to clean and not as expensive as the other options out there. Definitely would repurchase them again for future use. Great high chairs! These are a very nice quality and easy to clean, which we all know is a plus for anything kiddos use. Highly recommend! This Natural Finish high chair is very strong, Sturdy, and very easy to assembly. It is made out of a wood. I would recommend it. These highchairs are pretty easy to assembly and are sturdy once you get them assembled tightly. They are a nice addition to our dining room. I have ordered 20 or so of these high chairs. The first 16 were amazing, easy to assemble. The last four i have gotten the the drilled holes and slats do not line up. Had to take home and make adjustments to get them to work. These are very easy to put together. High quality just like you see in every other restaurant. If you don't have a high chair for customers i suggest getting one. You will be surprised how many people use it! Did not take long to assemble. Very sturdy and goes well with our black chairs and marble tables. Perfect height for them! Also easy to stack on top of each other. The first one came broken. The replacement was received and the black straps are wrong! Both are one end. Not even sturdy after taking a half hour to put together. Thank you for your feedback! We are sorry your Lancaster Table & Seating Ready-to-Assemble Stacking Restaurant Wood High Chair with Natural Finish was defective. Corrective action has been taken and a Customer Solutions Representative will remain in contact with you about this. I've ordered several of these high chairs for my restaurant! They are easy to handle, space saving and provide a save way for my younger customers to sit at the table! Thank you for your feedback! We’re sorry you did not prefer this product. Please contact our Customer Solutions team with any installation information or check out the resources section of our site for installation instructions. Much better option that the dark finish for some reason. Really seem to hold up better, but in finish and in quality. Still wouldn't recommend getting wet. This is a perfect product for it's intended use. It has an attractive natural finish, it's light/easy to carry around, very easy to clean and safe for toddlers. This is a nice high chair for the price. It does take some time to put together and the straps have a tendency of breaking. These are more or less disposable after a few seasons of hard use. This high chair has been fantastic! It was exceptionally easy to assemble with the clear, concise instructions. It also cleans up well and has been easy to maintain. These high chairs are great! Very sturdy and easy to wipe down. The seat belt is easy to work and the high chairs are not extremely heavy. These are great for the price! Very easy to set up and practical. The strap is a little cheap but they are still fantastic! Would purchase again! The chair is good! BUT the time it took to build it was absolutely crazy! It was very complicated and frustrating. I would probably want to buy a built out chair rather than this again. We appreciate your review, Mahesh! We are sorry you had difficulty constructing this high chair. If you ever have any questions about the product you purchased, please contact our Customer Solutions team. These Lancaster table & seating natural finish stacking restaurant wood high chairs are very nice. Not to heavy yet they are durable and they are easy to clean . Pretty straight forward on assembly. One screw would not go all the way in, but was easily fixed by using a drill. The price is excellent either way. Our customers who use our high chairs seem to love them, and it's because of the high quality, sturdy nature of the chair itself. Children can feel safe sitting in these high chairs. These high chairs are very nice. They stack easily so they store well, and they're just the right height for a standard booth or table. So far so good! After one year of tough use in our ice cream shop, it still looks like new. We clean it regularly with a soapy sponge and that does the trick! This chair is not too heavy, yet it still feels solid. Not difficult to put together either. Great deal for the price. I plan on buying another one. this Natural Finish Stacking Restaurant Wood High Chairs came unassembled. Putting them together was easy and took less than 5 mins to get them into service, They look great in our restaurant we have 3 pieces. And we are happy with our purchase. 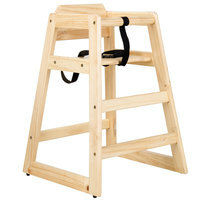 These stacking wooden high chairs are easy to use and lightweight. I would recommend using power tools for assembly. They have a beautiful light wooden color and a clear coating. Nice high chair and nice price. I am glad they are stackable. Took us about 10-15 minutes to put together. I was worried about the quality but and pleasantly surprised and will order more. Thank you for the review, Brandon! We're sorry these high chairs have not worked well for you. A Customer Solutions Representative will be contacting you about resolving the issues. We just got this product, we like that it comes unassembled saving freight and storage costs. Our customers liked this product because it complies with all safety measures for small children and the fact that it cleans easily and stacks too. Downside is that these come unassembled. Upside is that it was quick and easy to put together. Each chair took about 5-10 minutes and appear to be the same as others that I have seen in local restaurants. Great product! This item worked out perfectly in my restaurant. We would def recommend this to other locations. Thank you Webstaurant for shipping quality products! These chairs look nice until they are used a few times, not sturdy. The bottom rail broke right off of all of them and the connections between the different rails are all pulling apart. Would not recommend for any place where they would get used on a regular basis. Thank you for the review, Tom. We're sorry these high chairs did not last for you. Please remember to contact us right away when an issue arises. I love this purchase. This chair is so cute and very good for kids.. I will order again because it gets a lot of attention. These Lancaster High chairs arrived and they were easy to assemble and have held up very well. They are sturdy and the unfinished wood is a great addition. We use them as is but its a great value to be able to stain them if we want to change the look. Easy to assembly, although the little wrench that came with it was a royal pain to use. Overall a good deal for the money, stores easy and of good quality. Used to buy these until we moved to a darker color high chair. Installation is decent, having a screw gun is very helpful but they do include an allen wrench. We are a small cafe but we have 3 of these and they really hold up to the challenge. They clean up very well and stay looking very nice. Got this highchair about a month ago. I have them stacked and was disappointed when the legs started to separate. I did fix the problem but there is no warning not to stack and it is a obvious way to store them. Price is right; easy to assemble and light weight, but be aware the already assembled panels come apart and need to be reglued as these came apart days after being assembled. . . . Thank you for your review! We're sorry that this product did not meet your expectations. A Customer Solutions representative will be in contact with you soon to help resolve this problem. Our old high chair was broken, so we order this one. The unassembled highchair really save a lot on the shipping. We really like it. First, I love, love, love the color! We purchased these in black previously, but these are much easier to maintain. They don't get noticeably scratched like the ones in black either, so visually, they are much more appealing. The chairs are wonderful and highly recommended! They are easily put together in very little time and match almost any decor with the neutral (natural) finish. We have gotten a lot of compliments. We received these in good condition. They were really easy to put together and are rather sturdy. i would definitely buy again from this store. These high chairs are great. I bought these a few years ago and they are still in perfect condition with a lot of use. They clean up easily. The only downside is you have to assemble them, but totally worth it! Great! The quality, the price and durability of this Restaurant Wood High Chair is awesome we will be purchasing more for our growing business. We give this 4 stars. These chairs are easy to assemble and sturdy once they are put together. I especially appreciated how easily they were to stack since our storage space is quite tiny! I also like the strap in the middle...not all chairs have those. This is a great addition to our bakery. We purchased two and are very happy with the product and our customers are glad to have them! We are using these at our Lenten fish fry. They are really nice, and we are getting a lot of use and a lot of compliments. We have not had any high chairs until I bought these but I think we will be ordering two more. You cannot touch these for the money, they are a great value. Are you guys on Crack giving this product 5 stars. I have a several 200 + seat restaurants. I purchased around 15 of these high chairs approximately 5 months ago. All but 3 have fallen apart. I gambled with them because of the price. I believe the main problem is when you stack them. If you do not stack them they will probably last. I think when you stack them it puts too much stress on the glue joints. I now buy the $1 30 dollar plastic high chairs. You get what you pay for. Thank you for your review! We're sorry to hear your high chairs fell apart on you. If you are looking for plastic restaurant high chairs, you can find them here. This is a fine economical high chair, It is sturdy and gets the job done. My only complaint it that it doesn't have a finish on it at all. It feels like it is unsealed. As we are know highchairs can take a lot of abuse and for cleaning purposes it definitely needs a smooth sealed finish. This is raw wood. Thank you for your review! We're sorry to hear your chair didn't have a finish on it. A Customer Solutions Representative will remain in contact until the issue is resolved. A nice product. Very easy to put together. Takes hardly any time at all to put together. Buy unassembled and put it together yourself to save on shipping and cost. I just got this high chair couple month ago, it was ok! I order same hight chair about few year ago and I have to pay more. Their price is very reasonable ! Love it! Great Price!! Screw holes were very tight, so I drilled them out a slightly bigger so that I wouldn't strip out the allen screws. Once I did that assembly was quick and easy. We had old oak high chairs and it was time for an upgrade. The new ones are great and easy to assemble. Best price around! Very sturdy, and with the cross bar and seat buckle, it holds the child safely and securely. These stack very nicely so they can be put out of the way when not needed. An excellent and affordable wooden high chair with a natural finish. Easy to assemble and goes great with any furniture or type of restaurant establishment. I ordered this high chair unassembled. It was very light weight which was a plus. (Some can be so heavy to carry around) Assembly was a piece of cake. I would recommend this to anyone who is looking for a wooden high chair. Works great. Great for any family restaurant, cleans easily, super light and has a beautiful wood finish! Perfect for any little tyke thats coming for a bite to eat! Priced this chair many different places this was the best price , and it is built very sturdy it is made of solid wood and pretty heavy, with a seat belt.